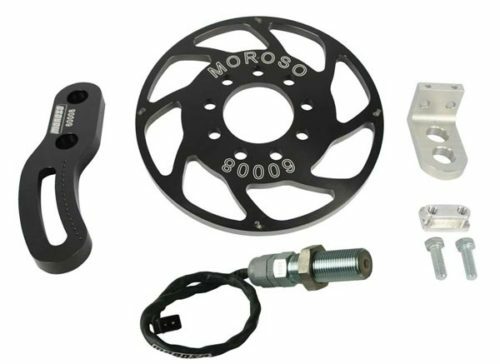 Moroso has designed the trigger wheel and adjuster arm to allow for infinite timing settings, while still giving you the ability to position the sensor for the greatest range of adjustment for your combination. 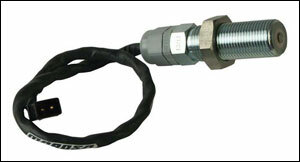 No more having the sensor run out of adjustment before you even start the engine up. The sensor mounting block is designed so that it will not stick out of the back of the arm and interfere with the oil pan. 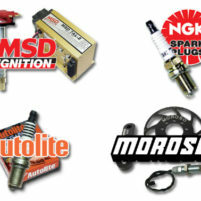 Moroso crank trigger sensor comes with a more common plug to easily hook to any popular ignition box with no modifications. Kit mounts to passenger-side of block only and has two sensor locations for non-motorplate applications. 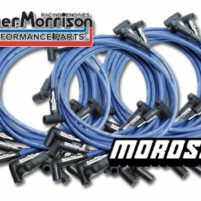 Optional Moroso Part No. 60025 Adjuster Kit allows Crank Trigger Ultra Series Kit to be even more user-friendly. High-quality transducer with zinc-plated, cold-rolled steel body reduces unwanted signal interference and improves triggering accuracy. Special, non-hardening epoxy impregnates pickup for shock and vibration isolation. Built-in strain relief prevents wire from pulling out of potting compound.